PS: From Cosmic to new readers. This site has never told the story of how I invented this. I invented Kick'n Trout® on a hook covered with cotton balls I got out of my wife's bathroom cabinet. Women use them to take off makeup. Little did I know that one week, a mountain lake, cotton balls, chemical flavors, bite enhancers and good note book would produce a REAL HONEST Trout formula I could be proud of. We started to sell to Cabela's in 2001 and now it is just unbelievable the amount of people and orders and telephone calls with guys telling un-believable stories about how they blow the other guys on the bank totally away, with the bottle being passed down the lake shore man to man. People even try to steel the bottle. Un-believable stories about the Trout even from FLY fishermen. I believe, I invented it on cotton balls and a hook.. out fished the other guys 3 to ZERO or 4 to ONE. I am serious about this product now that I have answered the 1-800 phone and heard with my own ears the stories. If you don't buy a bottle I can only say, sorry for you. Cosmic> 4th July, 2010. These are just a walk down the path from Stinky's RV Park in Idaho. This is a 5 pound Brook caught on Kick'n Trout by Stinky. Snake River RV Park. If you want a fun vacation hook up with Greg VanSteenkiste (Stinky) one of the only original founders of Kick'n Bass® Products. 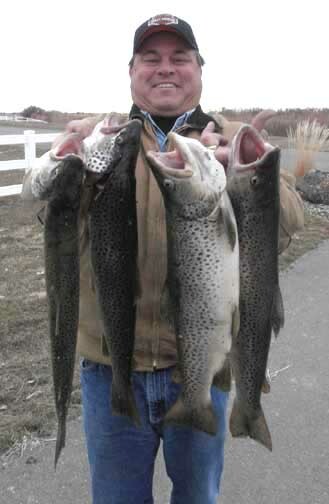 Now he runs a large RV park that you can walk to the Snake river from your RV and catch fish like these. Call 208-523-3362 phone or fax. www.snakeriverrvpark.net Kick'n Trout is sold right in his store, so go join him. After I sent the email, I went to your site and saw that the KNB Trout had some garlic oil in it. I showed it to my wife, so now we have to find a local source. If not I'll order some from Cabelas. If we think we need more garlic, I'll mix KNB garlic and the KNB Trout together. I was going to try some on a sponge piece, but the fishing action was too good and I forgot. There was at least a dozen other people fishing near us or we walked by them and talked to see what they were using. everyone of them was fishing power bait and most were using the salmon peach that for some reason seems to be the rage right now. They all had fish on the stringer, but they gad been there for a few hours. My wife put on Smelly Jelly Garlic, and I was delayed getting in the water. She had made several casts with the power worm with no luck. 10 minutes or so later I put on the KNB Garlic and wham, a nice 15 " trout. It hit very hard too. I caught 3 more in the next 20 minutes of which a lot of that time was spent fighting fish that were in the 2 lb plus range. My wife finally switched over to the KNB Garlic and wham she was on to fish. People started coming around to see what we were doing. A lot of them were using GULP SPRAY or the POWERBAIT TROUT attractant. I would say in the 2 days we were fishing, we were out fishing people 4 to one, and we were not fishing, what those familiar with the lake called, the best spots. Thank you for your reply. The season is over for us fishing the sierras, but we are anxious to try KNB Trout and KNB Garlic at some of the local lakes when the winter trout season starts. These lakes plant some big fish. I know people use Bite On Garlic at Lake Irvine. I am confident that the KNB Garlic will out fish it. I may send another report your way. 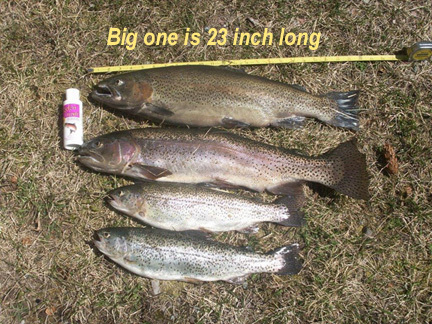 Kick'n Trout was developed to be used on all species of Trout and Salmon. The concentrated fish oils and scent enhances were specifically chosen to stimulate the bite response in this species of fish. The scent is a combinations of ingredients that make these fish bite. This product was first given a super hard test through the ice. It stuck to ice flies and jigs for hours and out produced everyone at every ice hole. Next it was tested on lakes and streams, the same results. 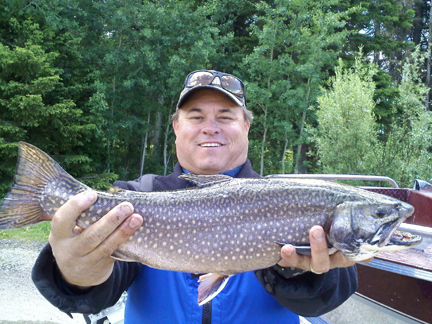 Read just our testimonies on Trout and you'll see what we are talking about. This product is new and fresh on the market. People are using it from North to South and East coast to West. Don't wait a year or two to find out it is the "Secret" no one wants to talk about. 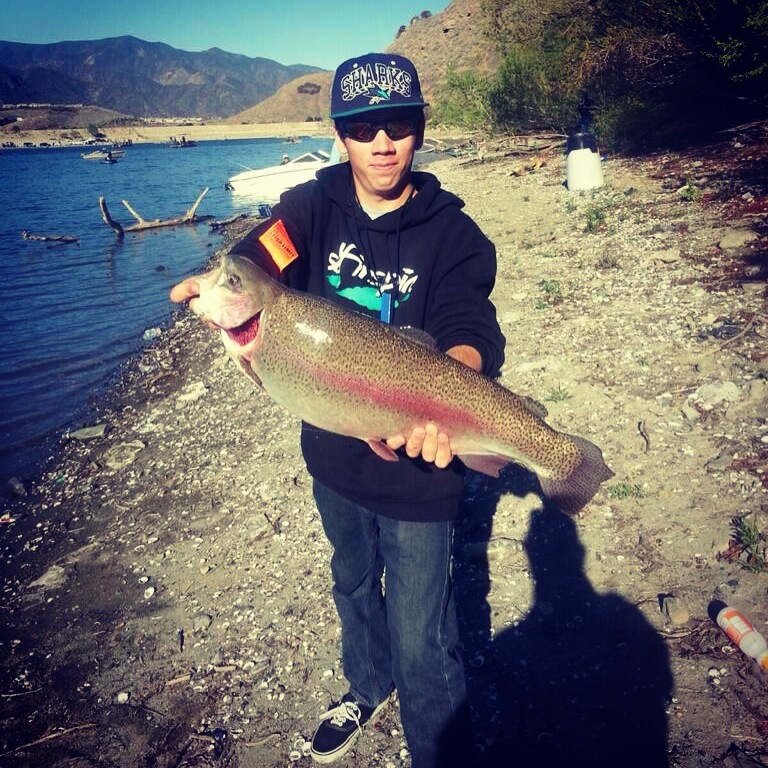 In some lakes in California and Oregon it is already the fastest selling Trout Formula on the market. Do yourself a favor, if you fish Trout or Salmon buy some now. It will enhance everything from night crawlers to egg sacs. You can turn a spinner or steel spoon into a fish oil smelling fish catcher. Remember big fish don't get that way from being dumb, they expect their minnow (steel spoon) to smell like minnows, think about that. Our four ounce concentrated bottle will treat everything from flies to spinners, all with the same rod slamming results. I have seen your products in the store, but always used a competitors scent every now and then. Well lets just say that the competitors scent is always changing or unavailable for some reason. Read some of the testimonials on your site and decided to give it a try since I was going to be fishing with 2 other float tubers that day and wanted an edge. Showed up at the store that has your product and WTF, it was out of stock. Well I settled with the Kickin Bass Shad/Anise formula since shad is present in Shadow Cliffs and I have witnessed trout chasing them down. Showed up in the morning and rigged up and added a few drops of the scent on my worm, within 5 minutes had one in the net. The spot I fish usually produces with or without scent so it was hard to determine if this scent was the trick. By noon it was pretty apparent that the bite was slow as there were about 8 other tubers and boaters in the same area and no one was hooking anything and I mean anything. I kept hooking fish after fish using Kickin Bass scent. One of the guys that I fish with was shadowing me as I kept hooking trout and he couldnt get bit, it was pretty amazing how fast these fish were on the bait with Kickin Bass scent as soon as it hit bottom. I have never fished with a scent that really allowed me to see the difference between getting bit with scent or no scent, I am completely sold with this scent you can see the difference big time, especially when the fish you are after are pressured, this scent was like gold that day. I fish between 5-6 times a month all over California and will be introducing this scent to my arsenal of lures, baits and locations, thanks for a great product. One idea I have is to use a label that I can peel off, so no one else will know my trick!!! "I have never caught as many or as big of fish until I started using Kick'n Bass®. The fish I caught were Trout! in the last week I caught over 15 two pounder, 3 five pounders, 1 big eight and granddaddy a 10 pound Rainbow! This Kick'n Bass® fish attractant is incredible !" 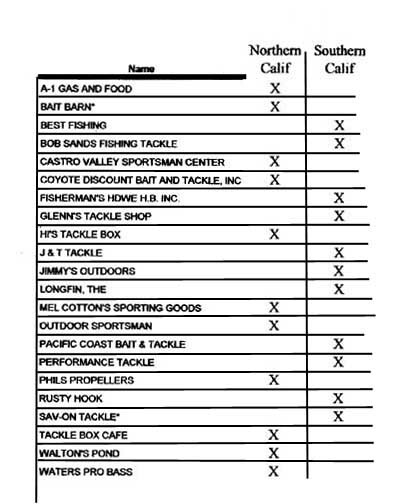 Roy Hendricks, fishing fanatic, Antioch, Ca. (This was even before we had our Trout formula bottled! I know what youre thinking! We use Very Light, Long Rods, Quality Reels, Light Line, Quality split shot, Laser sharpened hooks, Custom floats and Roe Bags. The best of equipment, and all natural bait! This letter is to let people that use the internet know your product Kick'n Trout really does the job! My friend and fishing buddy Roger have been using the Kick'n Trout since January a couple times a week. We have tried putting it on one rod and not the other and it out fished the other rod by about four to one. We have some of the guys ready to throw us in the lake. As you know I got my first order of four bottles in January and I placed my second order the 12th of May. I have got a limit of Trout every time out. I use barbless hooks so I can release the smaller fish. The largest Trout I caught was 12 lbs. 4 ozs. at Shadow Cliffs Lake, a "East Bay Regional Park '. The fish planted come from Mt. Lassen Hatchery, Calif. Fish & Game and Dessert Sands, Oregon. The water has started to warm up so the Trout season here is just over. From now on we will have to go the lakes in the Mountains. I have tried All the rest and now I use only the BEST! I hope that one of our local tackle shops will start to stock your product soon. But until then I will have to buy it from you and keep paying shipping charges. Was nailing Trout with powerbait dipped in Kick n Trout. 10 fish in 4 hours while others anglers watched in envy. The Trout averaged 2 pounds. I recently started fishing for Trout seriously only in the past two years. In 1998, I went to the Fred Hall fishing show in my area and came upon the booth that was presenting "Kick'n Bass". The guy was so persistent telling me how great this stuff was, that I finally bought a bottle of "Kick'n Bass" with garlic. I bought the scent with the garlic because I know that sometimes a garlic scent alone will attract more Trout to the bait. I was anxious to try this stuff as soon as I could. I tried this stuff out at Irvine Lake, which is private lake in Orange County, California , and to be very honest with you, I didn't see any significant results. In fact, I was down right disappointed because of what I thought was just hype the guy at the fishing show was giving me. I stopped using it for the rest of the Trout season. angler was just raving about using "Kick'n Bass". My first instincts were that this guy must be joking, because the previous year I had tried it, I didn't get any more bites with this stuff. Later, I kept on reading more favorable reports about him catching lots of Trout using this "Kick'n Bass" scent and I began to wonder if I really gave this stuff a fair chance, mainly because of the integrity of this man who was submitting these very successful Trout reports. This man's name is Jeff Sun, who is the web master for the www.fishinghotpage.com . I have the utmost respect for this mans testimony and I believe he would never falsify any reports. I therefore decided to give "Kick'n Bass" another try. I don't know why last year it didn't do anything, but this year I am constantly catching limits within a few hours and not waiting all day to limit. I have been fishing on the average 3 times a week and using "Kick'n Bass" has been absolutely devastating on the Trout. Just about every time I go fishing at Irvine Lake, there are people on both sides of me not catching and I am just killing the Trout left and right. They can't help but notice how much action I am getting. For those of them who are curious enough to ask, I proudly tell them that I using "Kick'n Bass" on my night crawlers. They are in awe and amazement how well I do. I know for a fact that everyone that has seen me catch Trout and ask me what I'm using, went out and bought some "Kick'n Bass" scent with garlic. This stuff is beyond incredible. The only problem with this stuff is trying to have enough of it on hand. It sells out so fast, that I have to buy several bottles at a time so I don't run out. This testimony is true and I have people who can back me up on this because they all use "Kick'n Bass" too. Trout fishing has never been better thanks to "Kick'n Bass"! Thanks for reprinting my report on quickness. I just returned from the Eastern Sierra's on June 4, 1999. I fished at Crowley Lake and I took along the Kick'n Bass and the Kick'n Trout scent. If you recall the very first year I tried Kick'n Bass, I didn't get any significant results. In my last report I forgot to tell you I tried this stuff in the Eastern Sierra's and it didn't work there either...so it seemed. Anyway, that was a year ago. Since I did so well at local lakes in Southern California this year, I decided to take it along up to high country lakes in the Sierra's. This time I brought both Kick'n Bass and Kick'n Trout and the results were incredible. I caught limits within minutes not hours. This stuff again impressed me in being a firm believer in using "scents", and Kick'n Bass® has it all over *kley Trout attractant. I am planning several more trips to the Sierra's in next month or so and I most definitely will be taking along the Kick'n Bass scents. dunk my bait directly into the bottle. Could you look into to this please. Thanks! I want to thank you for a great product. I have been bass fishing for 20 years and have tried all the scent products on the market. Let me just tell you I am 100% sold on your product!! I have been fishing Kick n' Bass scent after I received a sample while attending a fishing show last year. I was reluctant to try the scent as I was very convinced that a product I have used for the last 5 years was the best. I was told "Just try it and compare it to what you are using and I PROMISE you will be sold on Kick n' Bass!". Well, I did and after 2 trips where I fished my old favorite scent against Kick n' Bass, hands down your scent was Kick n' A.. over my old favorite. I fish the scent on spider jigs, pig n' jig, tubes, worms and even on my blades while slow rolling them. They definitely draw more strikes to the lures when applied and get the fish to hold on to the lures longer than without. I find that the scent also remains on the lures longer than any other scent I have used in the past. My personal favorite are the garlic scent and the crawdad scent. Recently I starting using Kick n' Trout scent on 1/64 oz. crappie tubes with power Trout worms. With the scent applied I have found that Trout will take the jig / worm combo deeper in the mouth and hang on, whereas without the scent applied, they often just nip at the worm and don't take the crappie jig in their mouth. Now in "Cabela's", "Bass Pro Shops" "
Salmon Eye Fishing Charters on Vancouver Island British Columbia. Oregon Steelhead, Salmon and Trout. Jigs, products and tons of information in 40 videos to chose from. Kokanee Power.org Great Steelhead, Salmon site from Oregon to California. 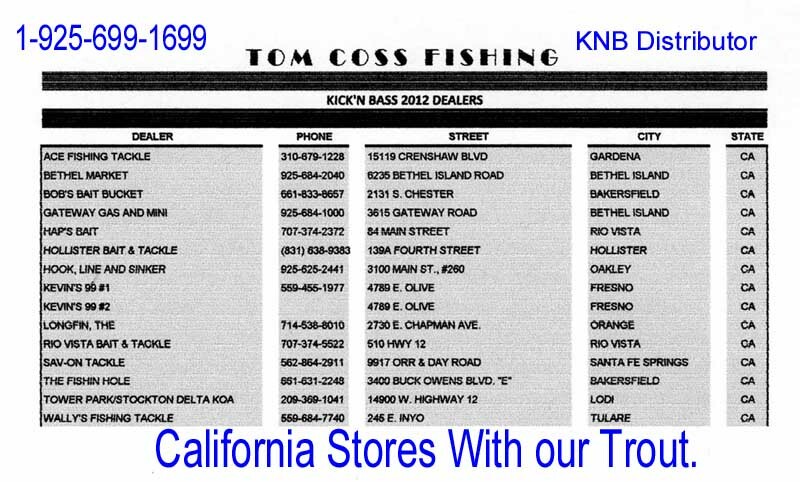 If you live in California, these stores are suppose to carry Kick'n Trout. If they don't have it in stock, ask them why not and tell them to call their distributor Tom Coss and order it. Then you save on UPS costs. Support your local store. To Return to Shopping Cart please click here.